Celebrating National "Read in the Bathtub Day" - 9th Feburary! Do you enjoy soaking in the bathtub? Do you wish to relax and feel light and free? Then, why not spoil yourself in a special day, celebrating a cute, rare and special bath story day "Read in the Bathtub Day" on 9 February!? So, let's "bubble" and enjoy a perfect bizarre, wacky, unique and wonderful holiday for bathtub readers that is celebrated in February! Did you know that February 9 is National Read in the Bathtub Day? Are you amongst its fans? No one knows about the origins of this day and how it became a holiday, but no doubt it's a wonderful idea to celebrate. National Read in the Bathtub Day - February 9, can be celebrated offering a special treat to yourself reading the favorite book while taking a bubble bath, enhancing the pleasure of reading with a delicate scent from the soap or bath foam, a subtle music background along with a glass of red wine, relaxing the body and offering delight to the mind and soul under the candles light. So, all reading in the bathtub lovers, let's enjoy the spirit of the day, letting ourselves lose a bit and accept this special treat in a cozy atmosphere while reading in the bath tub! You can easily transform this special day – Read in the Bathtub Day, celebrated on 9 February – into a wonderful bath story to remember! Simply relax, then prepare your bathtub into a special place to enjoy and relax – and create the magic formula – adding a drop of moisture, another drop of nurturing, and few scented drops to take a bath which will spoil your body and mind, and why not you sense and soul, too? So, chose the most delicate ingredients and fragrances, and offer to yourself few moments… or hours in a well being stage – accompanied by a good book, a glass of red wine, perfect musical background and… create your own wonderful bath story today! Herodotus quote about relaxation - "If a man insisted always on being serious, and never allowed himself a bit of fun and relaxation, he would go mad or become unstable without knowing it." 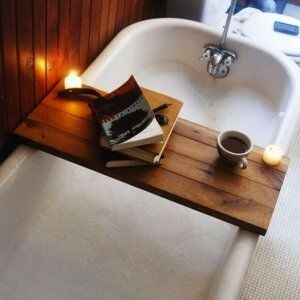 Do you like reading in the bathroom tub? I think that after a hectic day spent at work or making a lot of things around the house, even for a regular shower-taker, it would be a wonderful treat to yourself to prepare the bathtub with favorite shampoo bottles, soap wrappers, candles and relax few minutes in a bubbled atmosphere reading a bestseller, magazine, newspaper or other issue that makes you happy unwinding in a warm bath. So, love yourself, and once in a while celebrate the Read in the Bathtub Day, while reading and soaking, offering to yourself a journey of solitude, relaxation and revelation. Aldous Huxley quote about reading - "Every man who knows how to read has it in his power to magnify himself, to multiply the ways in which he exists, to make his life full, significant and interesting." Marcus Tullius Cicero quote about books - "A home without books is a body without soul." Relax in the bath tub after a busy hectic working day! Whenever you have a hectic day at work, and all you wish is to reach home, get into the bed and sleep… I suggest a different way to relax and comfort your body, soul and mind! Back home, turn on the music you like (make sure it’s not something sad or too melo, eventually try ambient music, classical, chilled out, pop music or a variety of styles), fill up the tub with water and foam, take a glass of wine, a Campari-orange delicious cocktail or a glass of fresh milk (whatever you prefer to enjoy the moment), and for about an hour, none will interfere to your peace. Henri Matisse quote about the art of balance - "What I dream of is an art of balance, of purity and serenity devoid of troubling or depressing subject matter - a soothing, calming influence on the mind, rather like a good armchair which provides relaxation from physical fatigue." To have fun and relax while reading into the bathtub, definitely you'll need a bath tub rack, chosen according to your preferences.